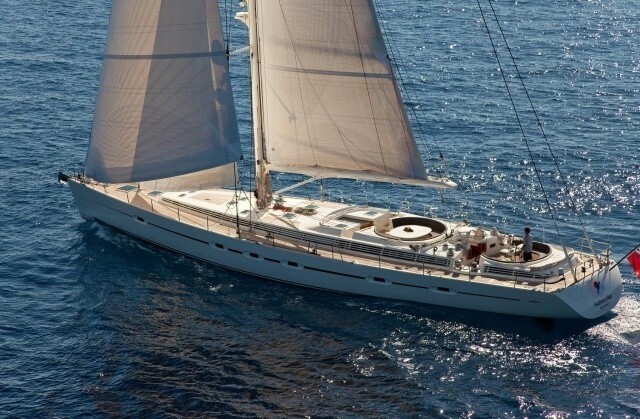 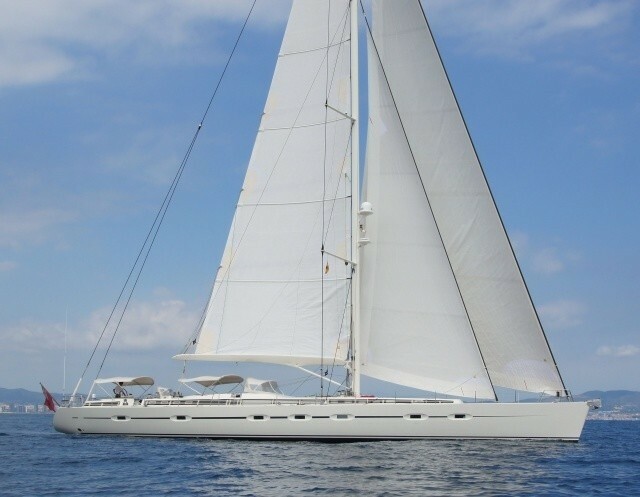 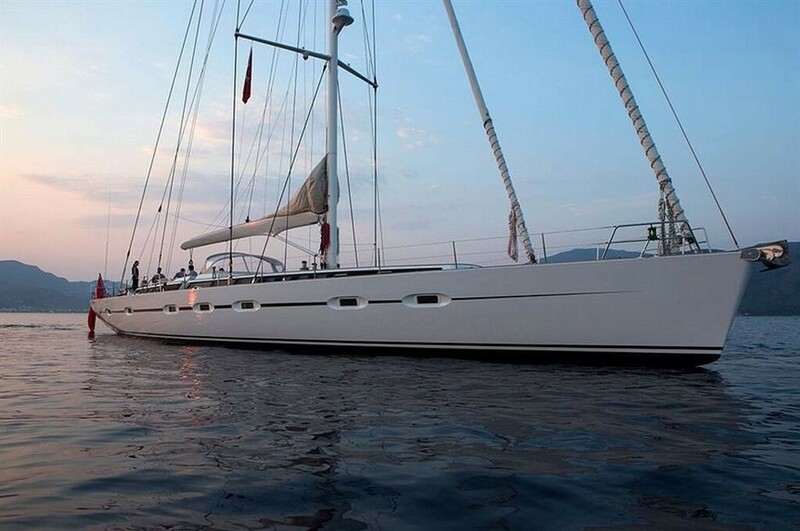 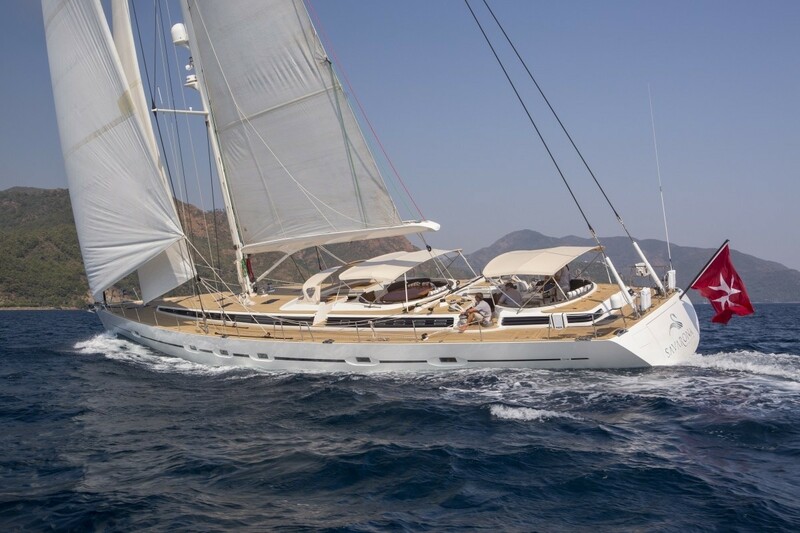 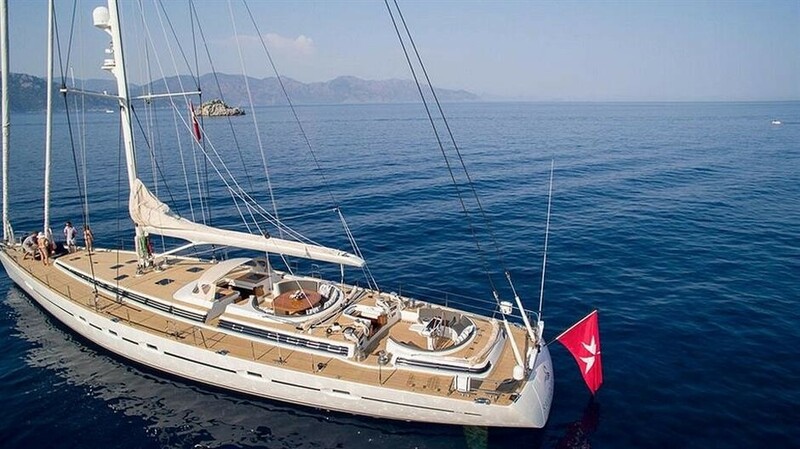 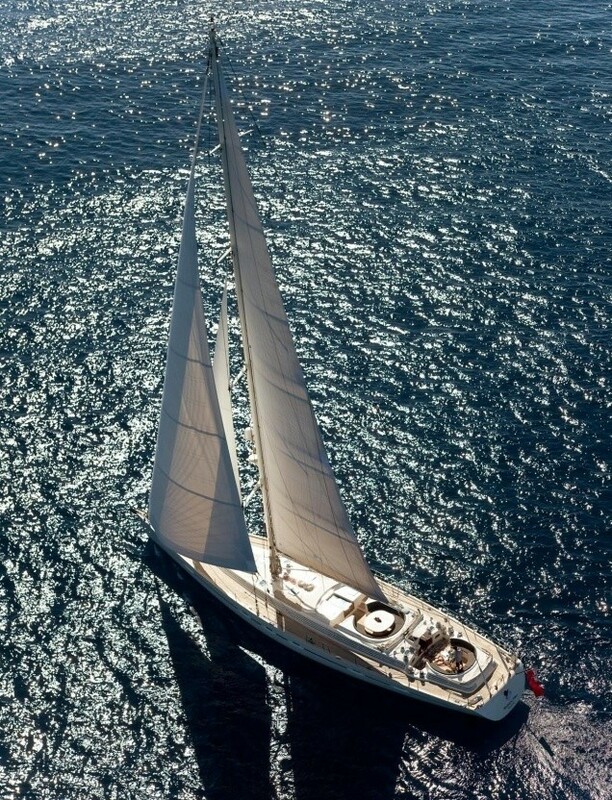 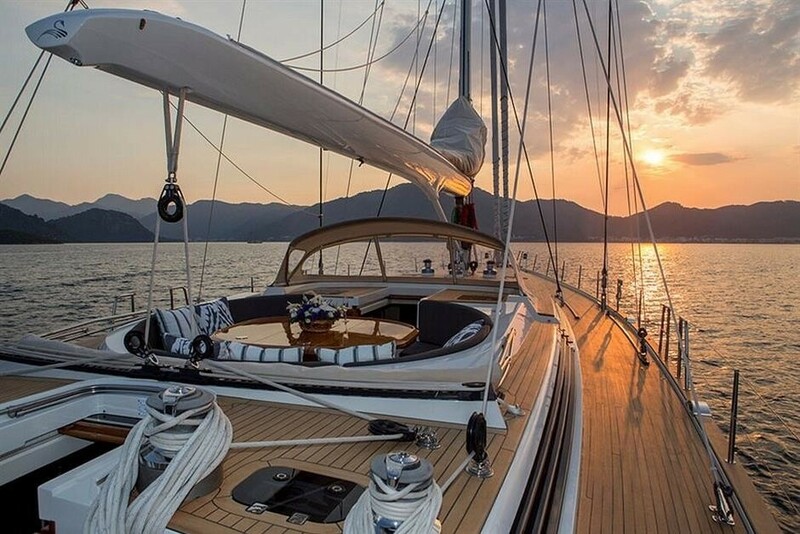 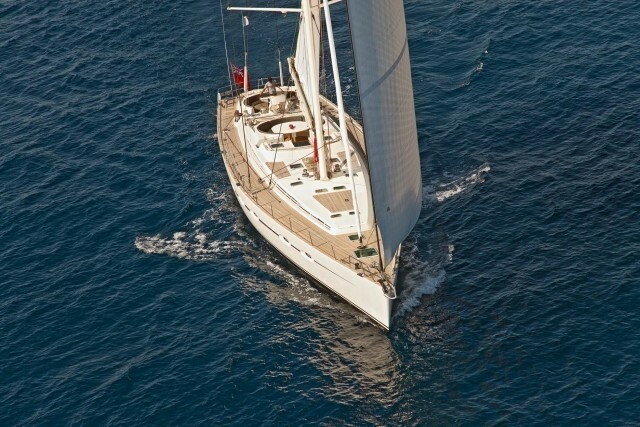 The beautiful 2001 sailing yacht SAVARONA, previously known as Nuberu Nau, is a majestic 28-metre sloop, built by the French shipyard CNB (Construction Navale Bordeaux). 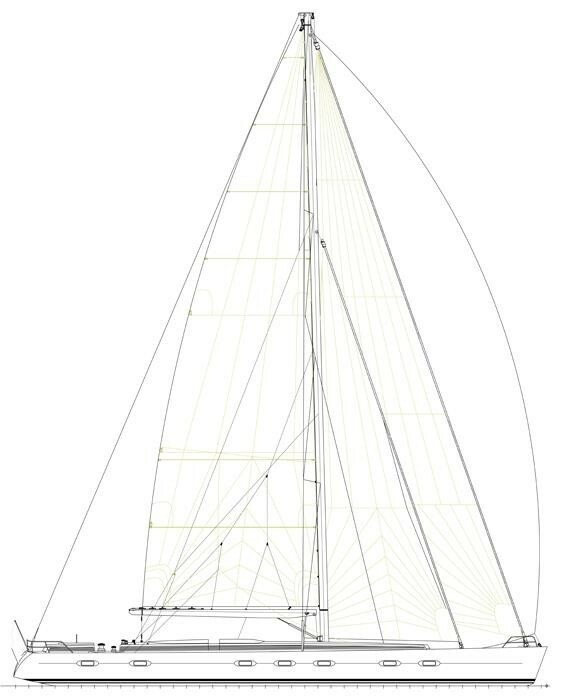 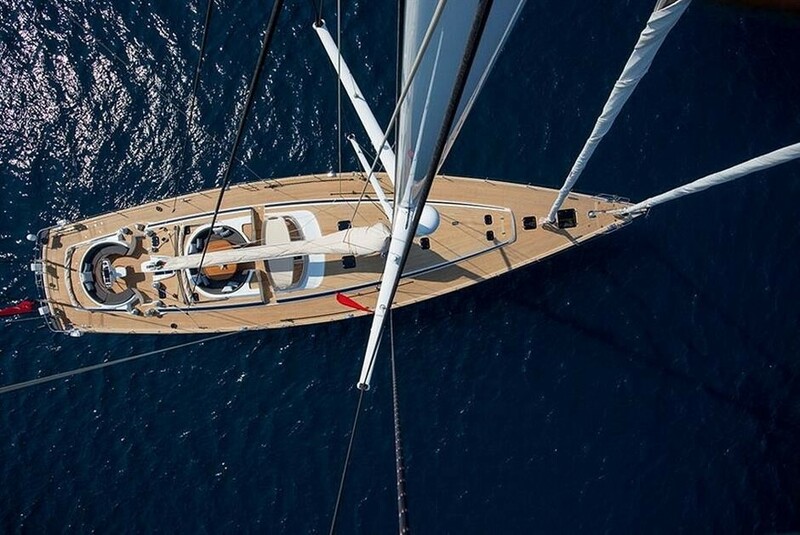 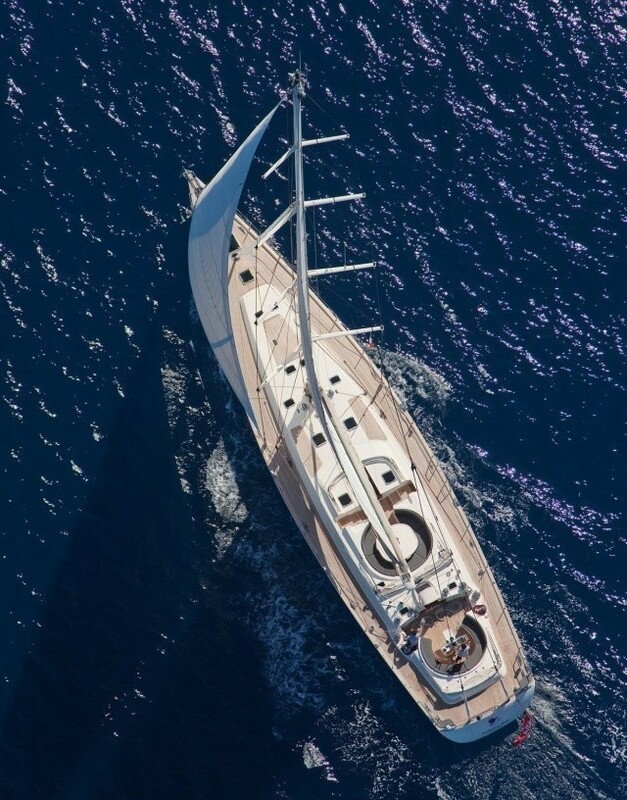 Refitted in 2015, S/Y SAVARONA bears exterior design by Franck Darnet Design and Philippe Cabon. 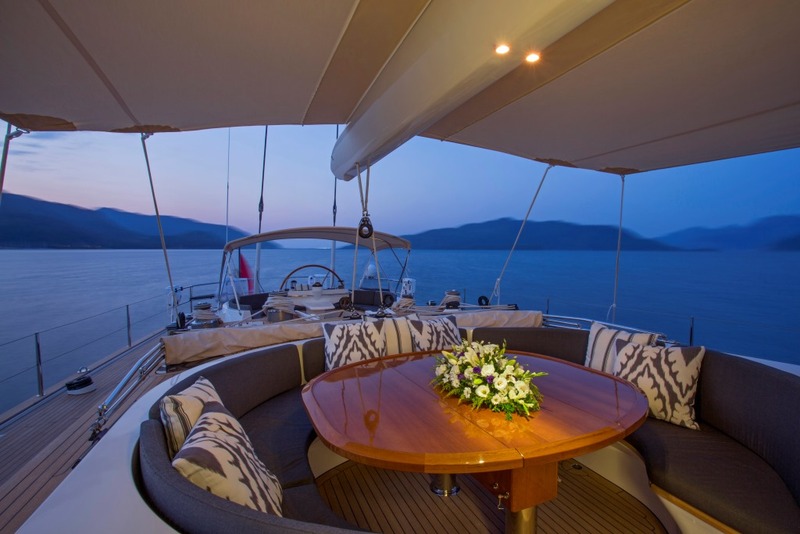 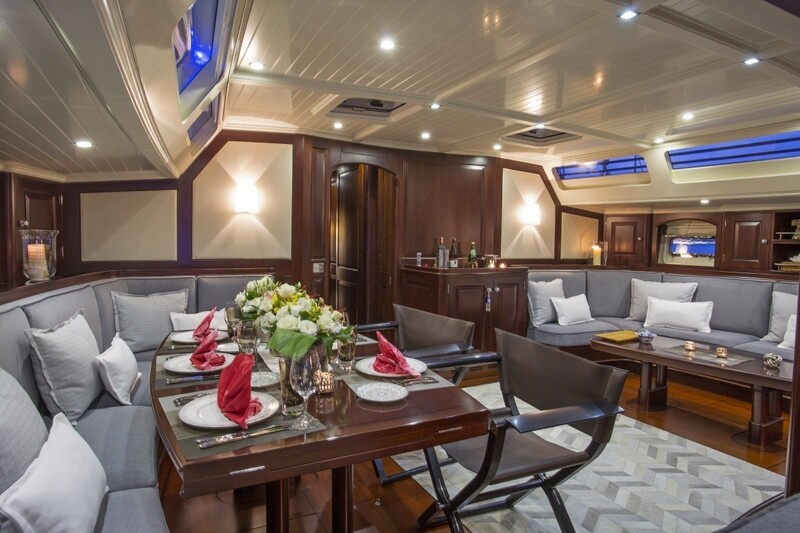 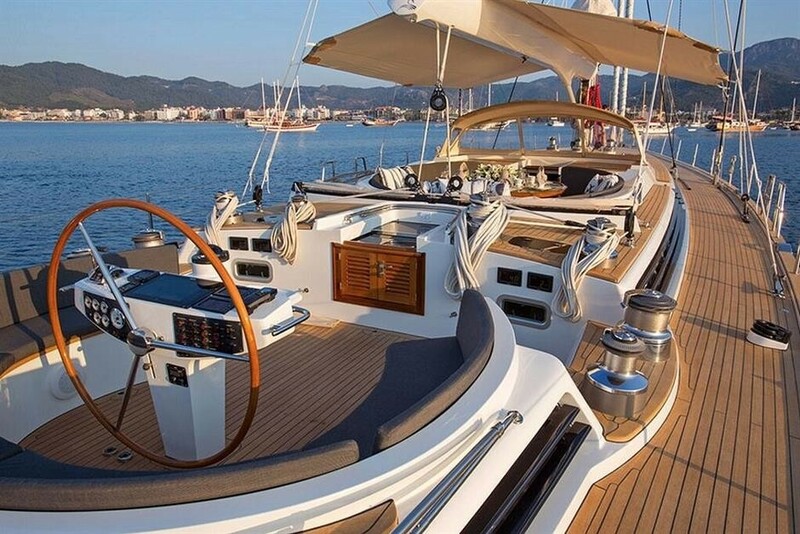 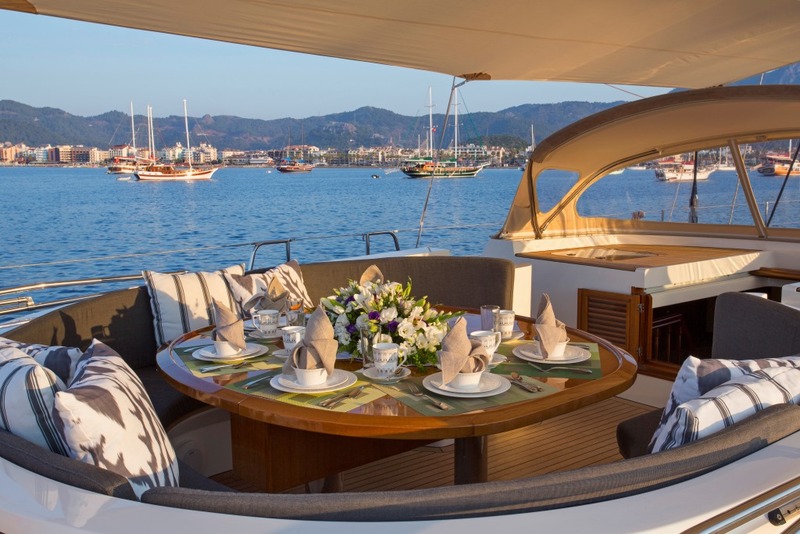 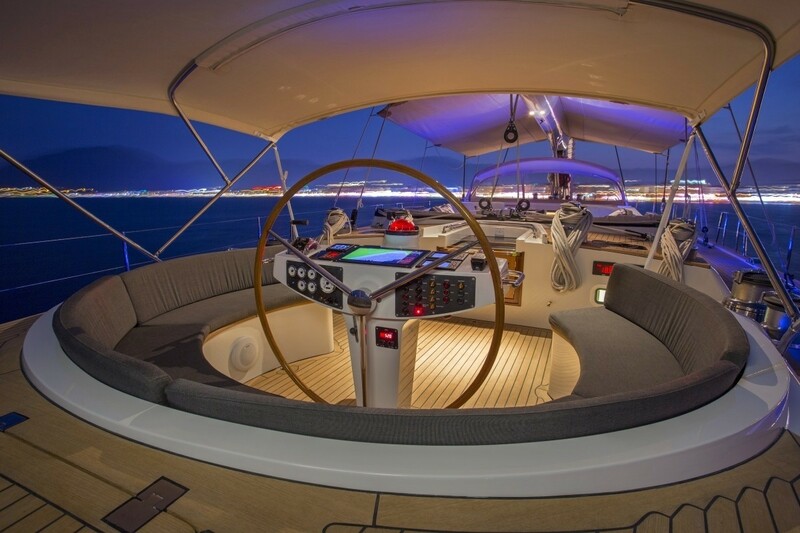 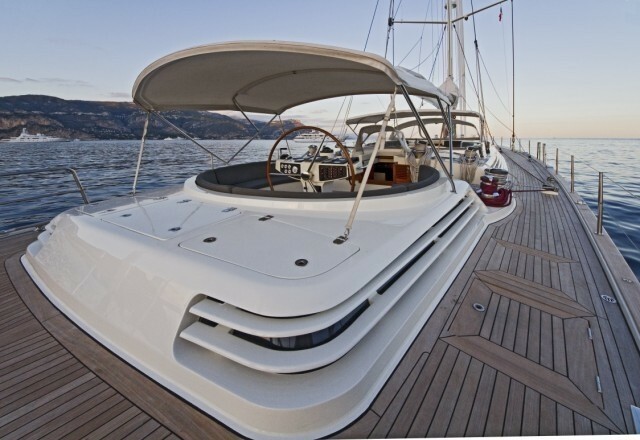 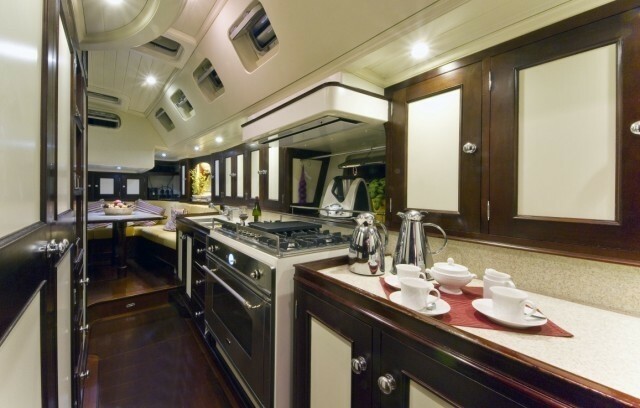 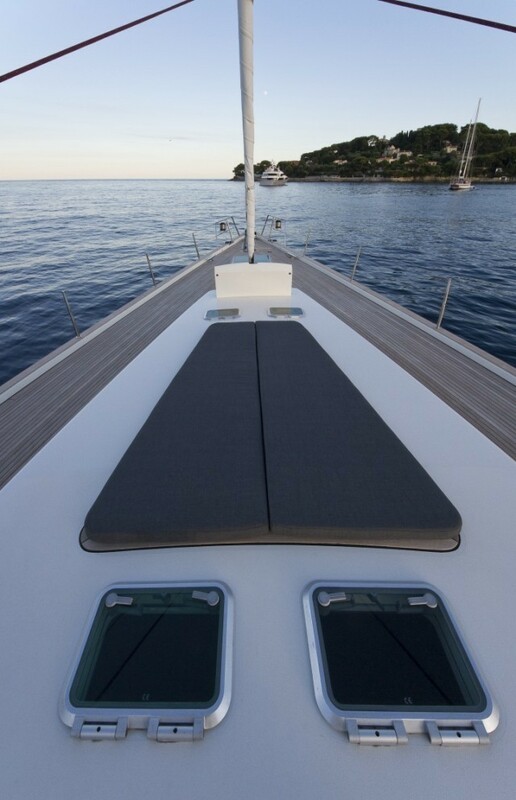 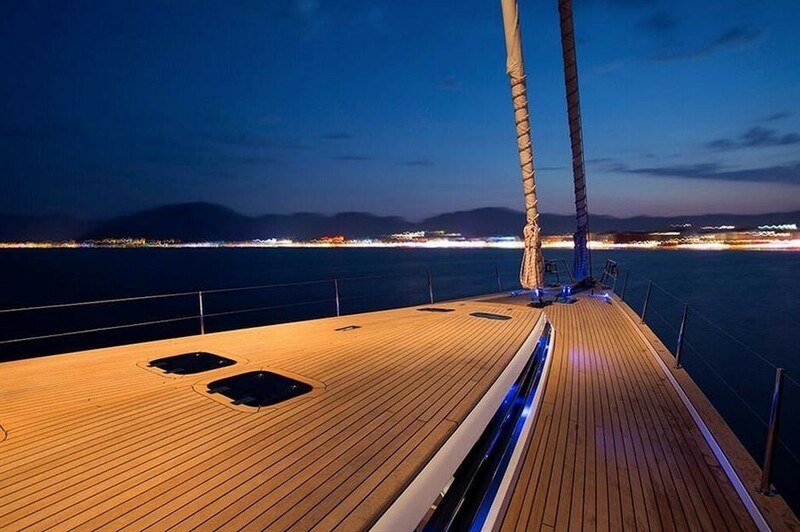 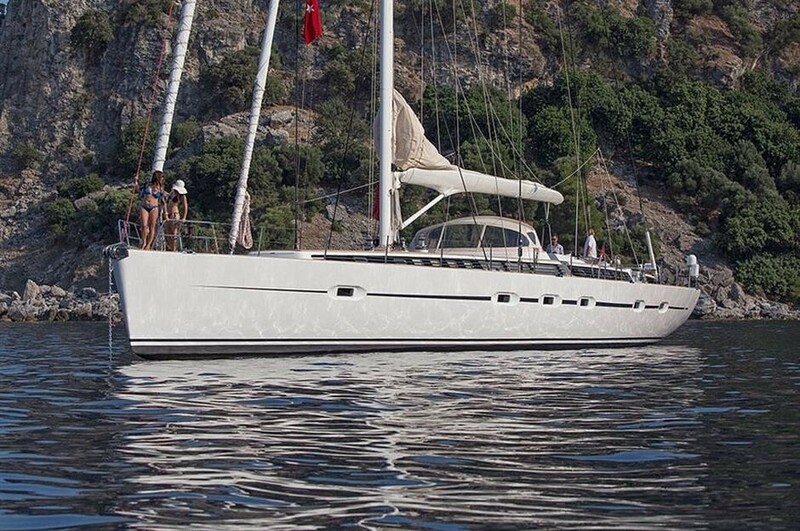 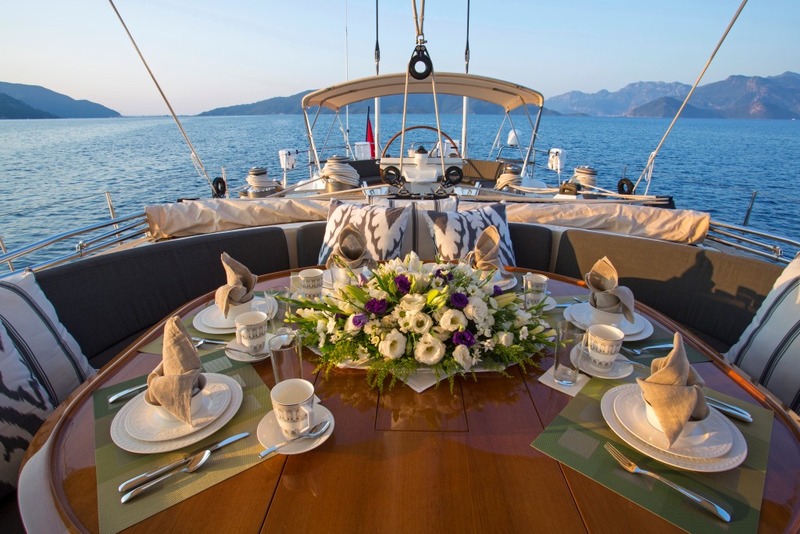 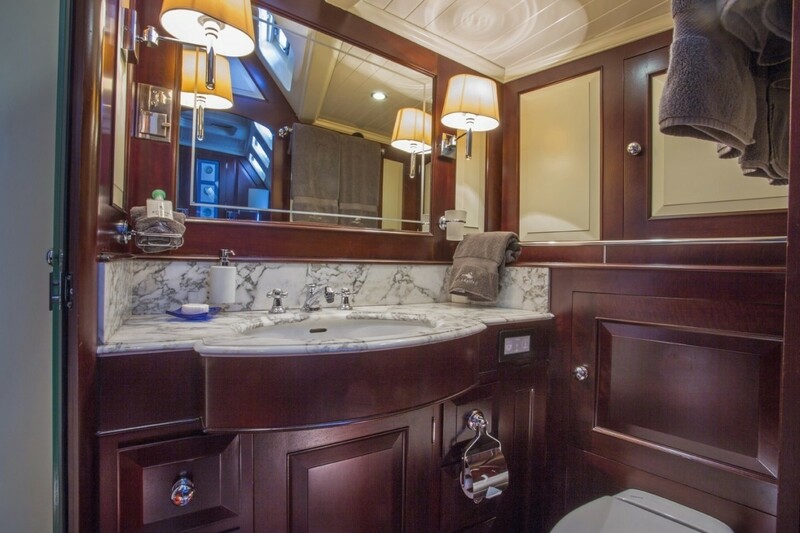 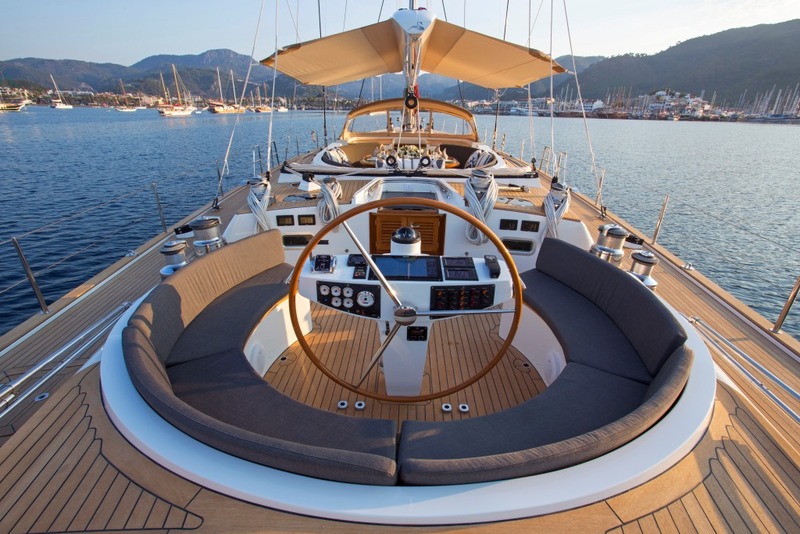 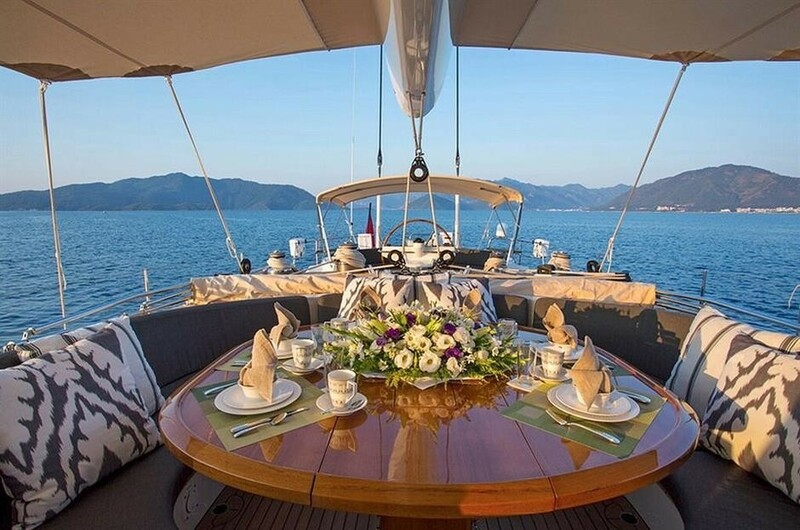 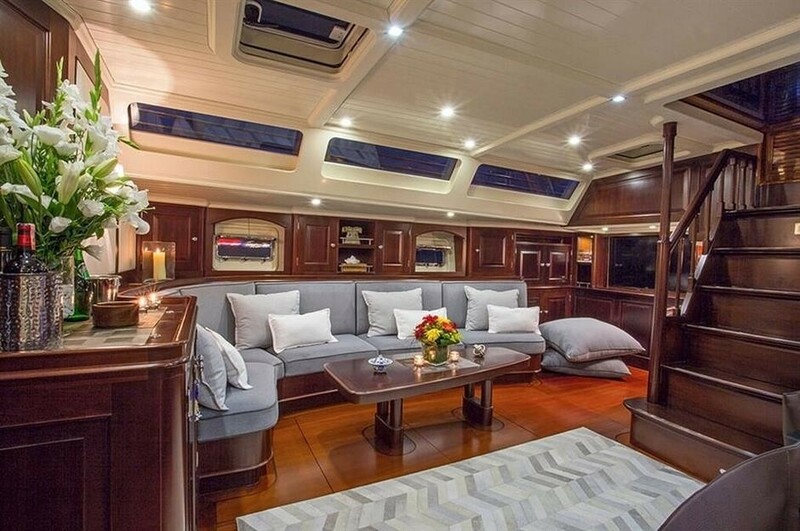 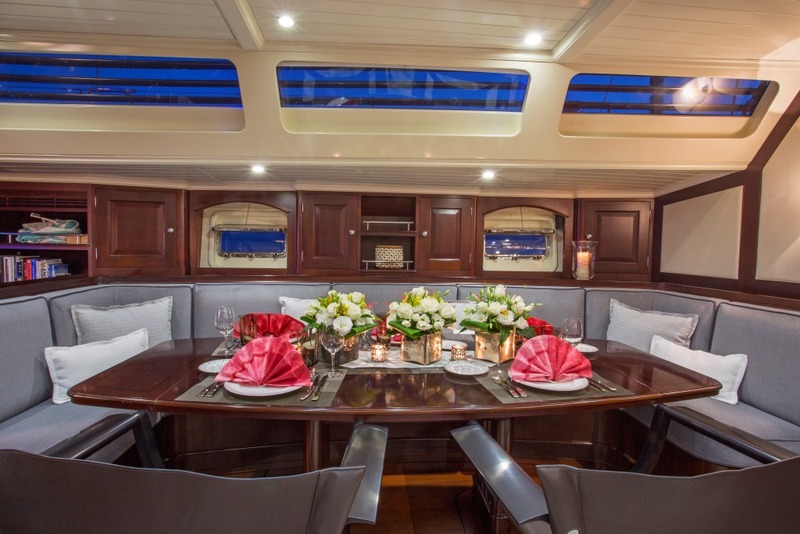 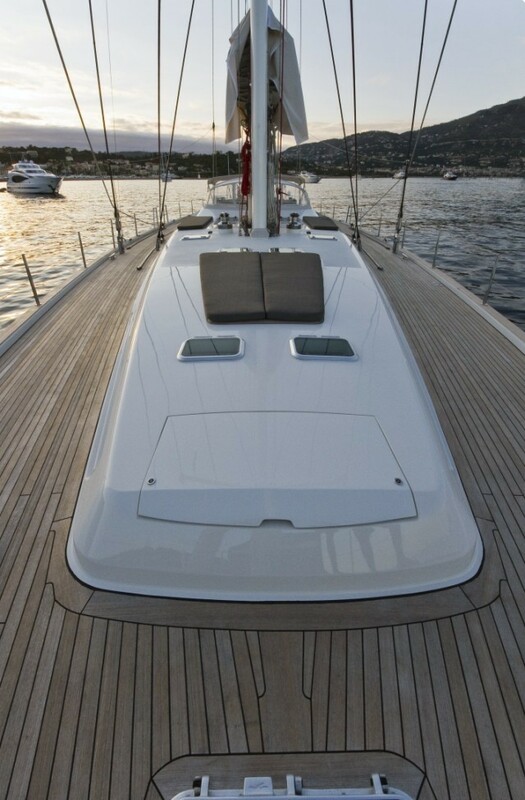 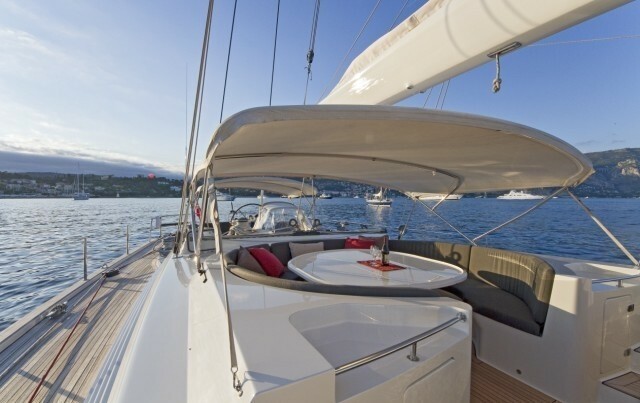 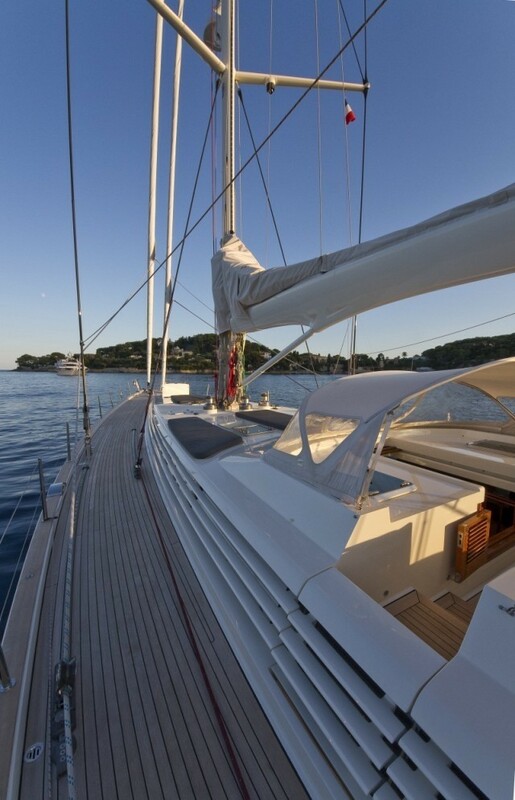 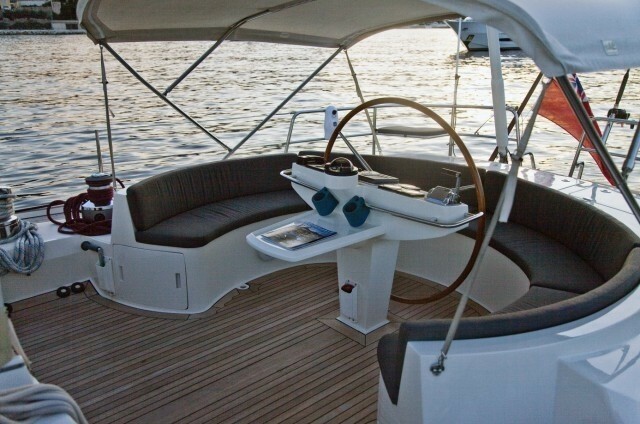 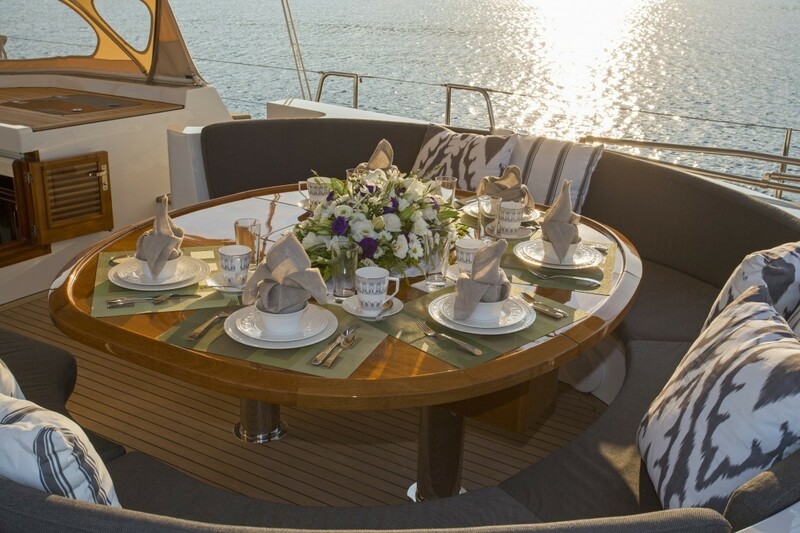 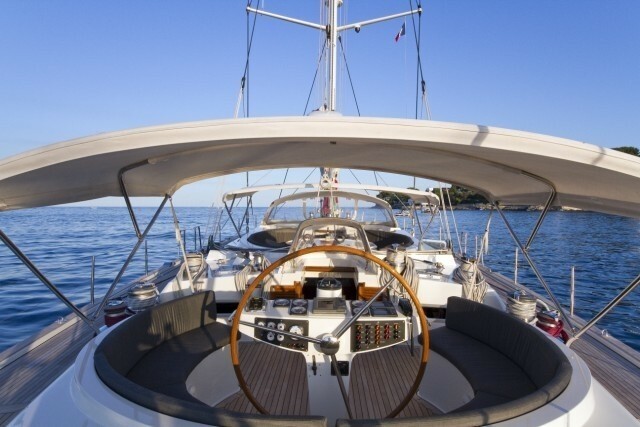 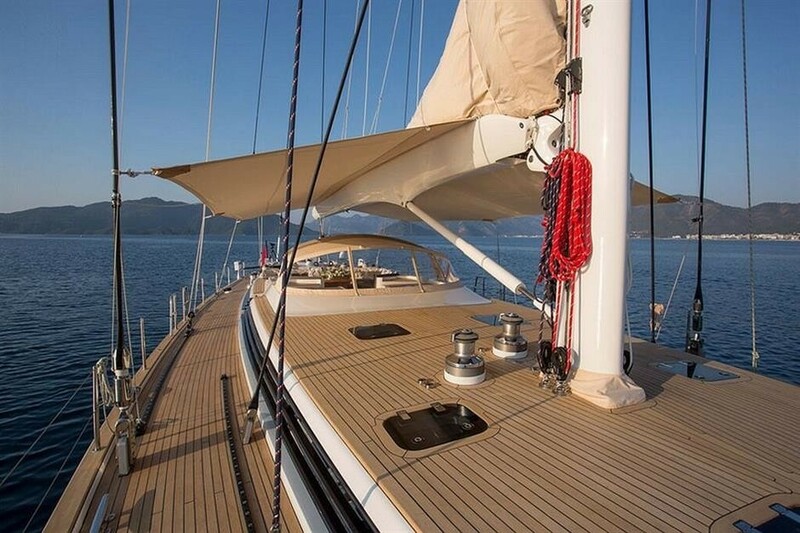 Franck Darnet Design has also created the elegant interiors of yacht SAVARONA. 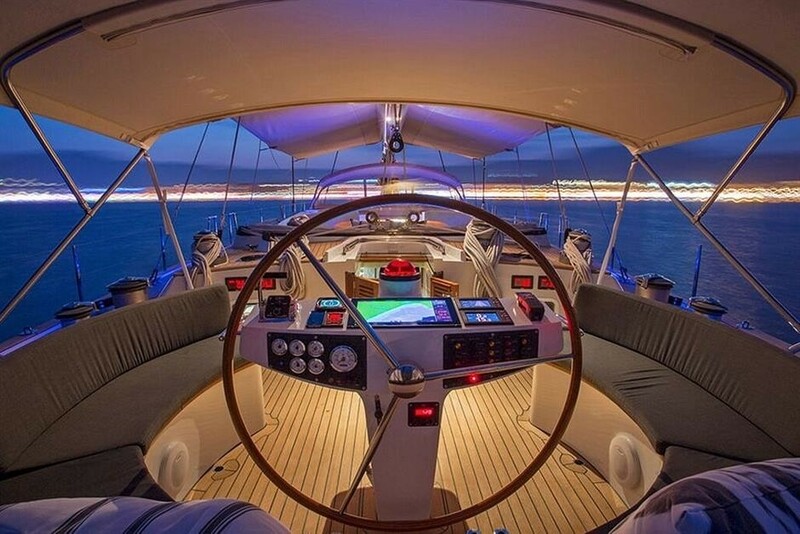 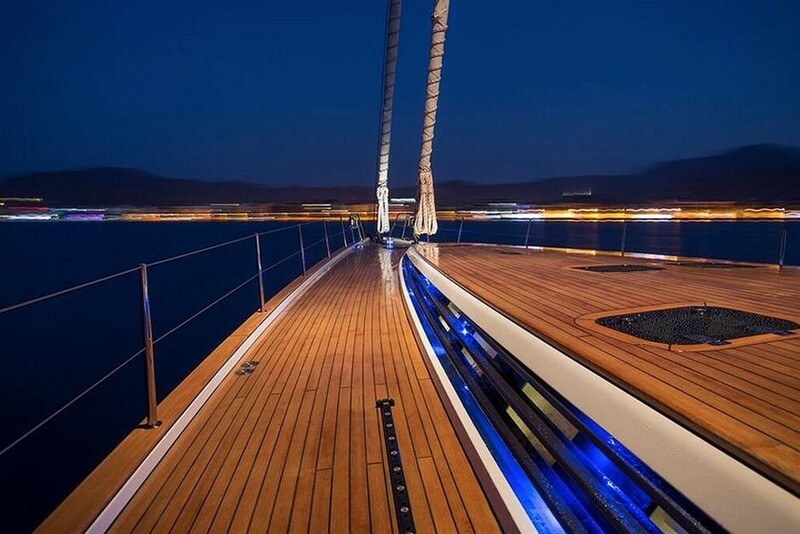 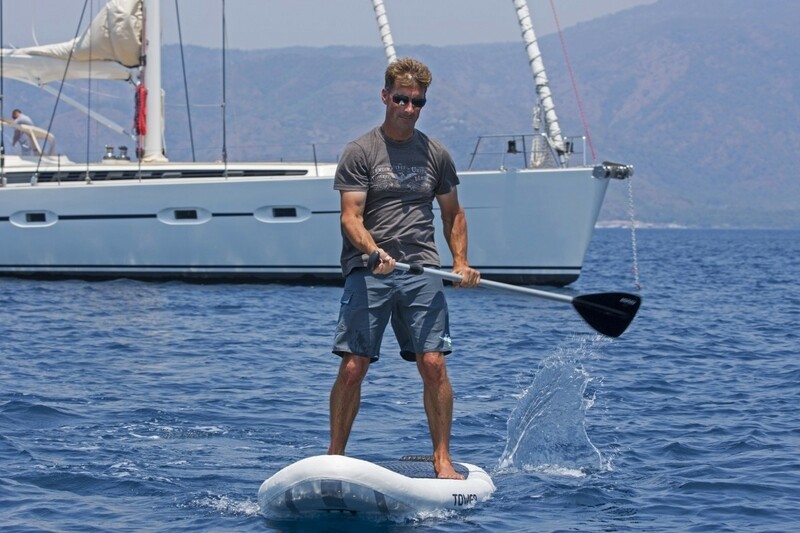 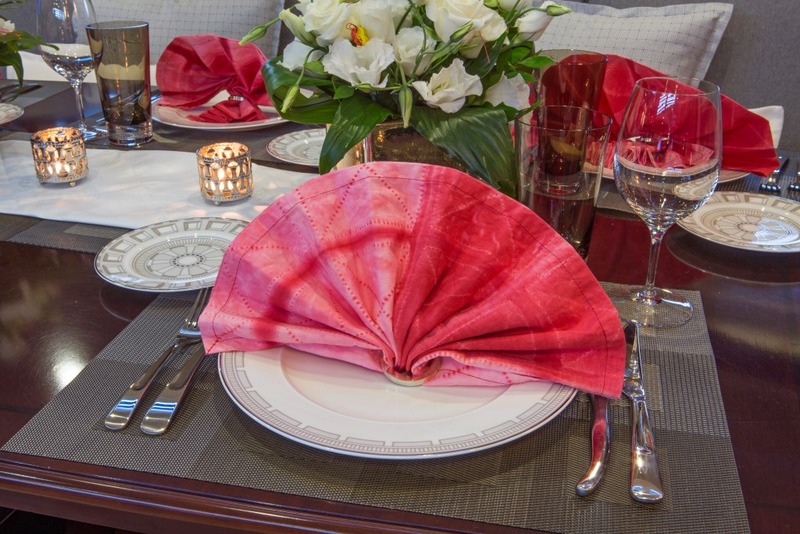 The yacht has an contemporary refined ambiance. 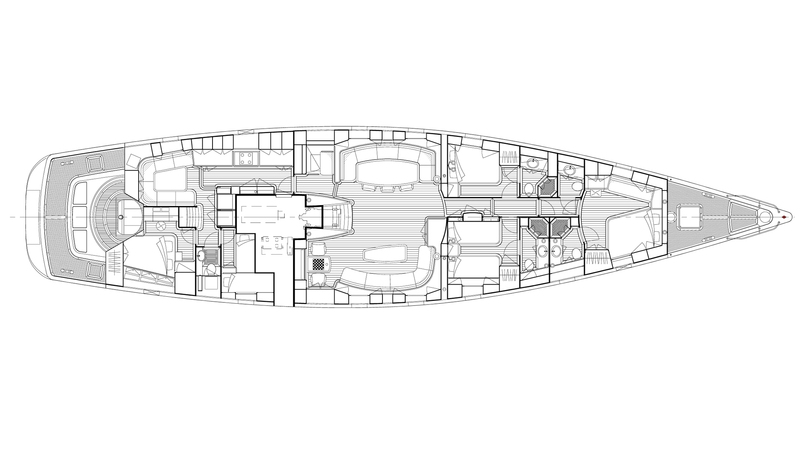 The salon and dining is an open plan, surrounded by upper hatches and side windows, allowing for ample natural light. 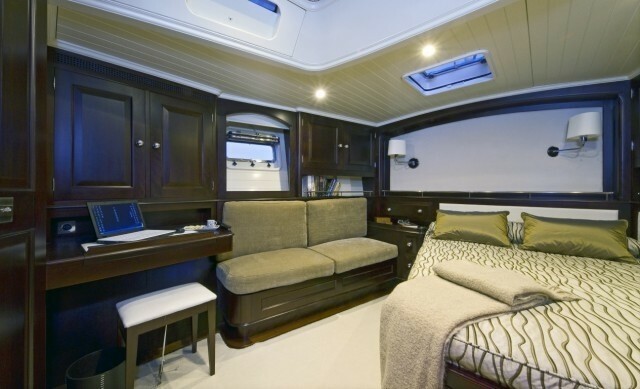 Rich wood panels are complimented by cool taupe toned upholstery. 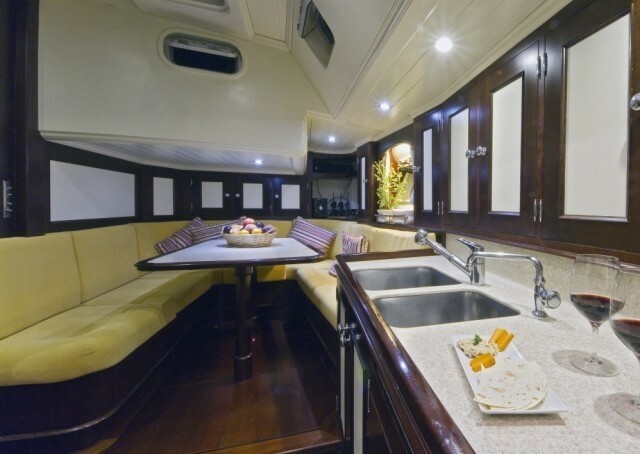 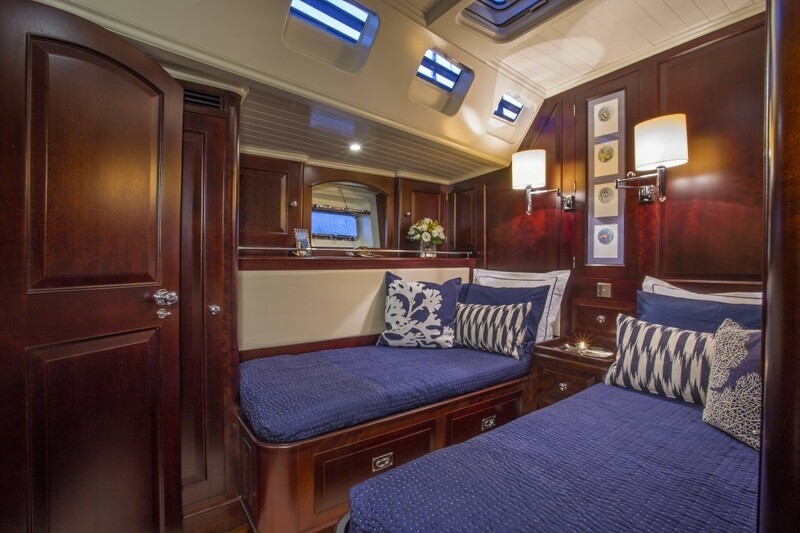 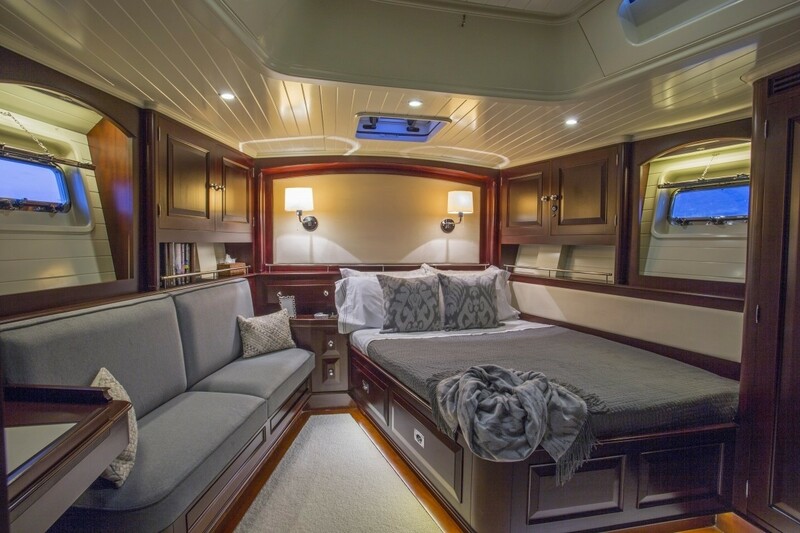 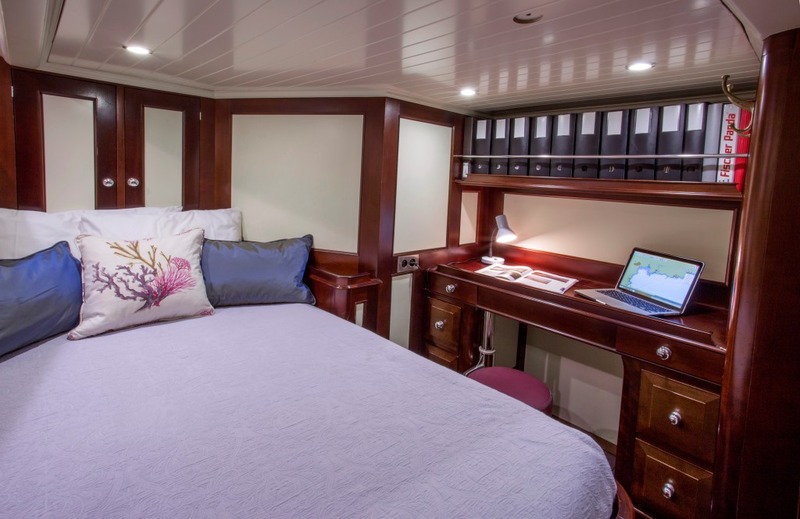 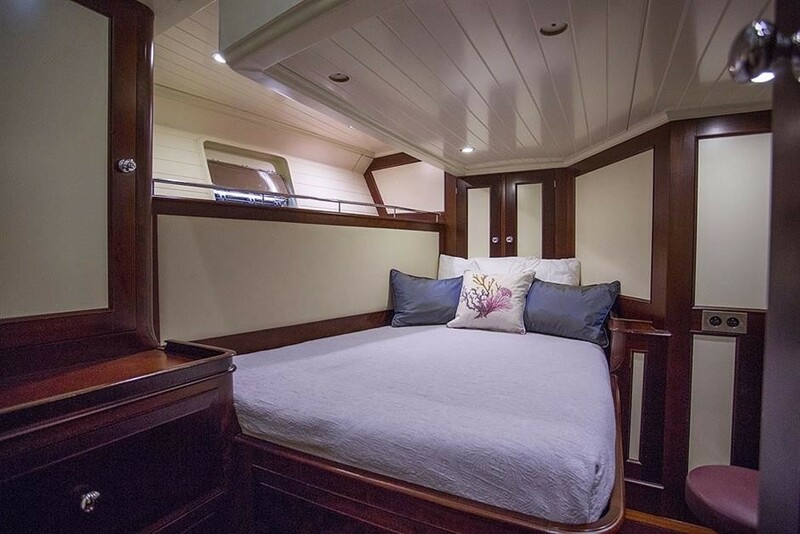 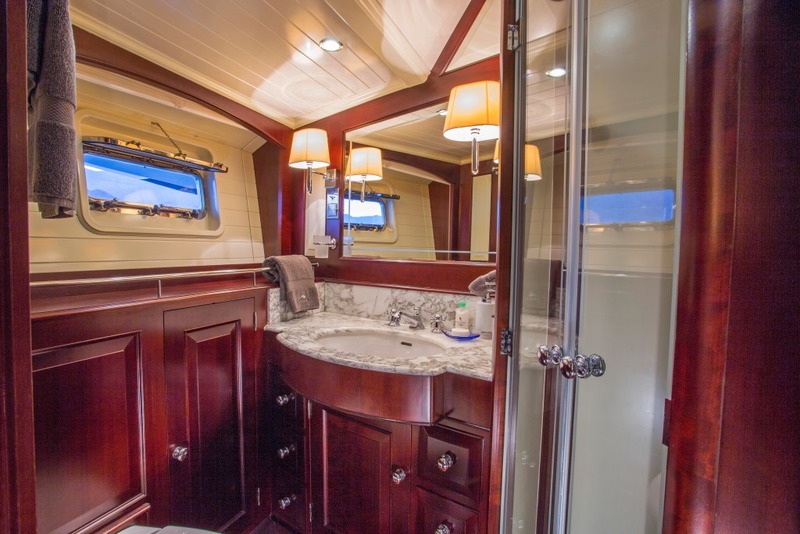 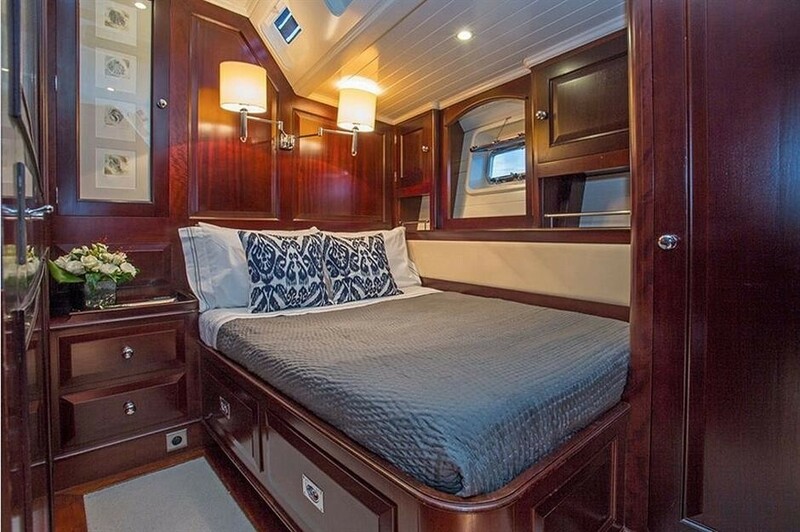 She comfortably sleeps up to 6 guests across three lovely staterooms. 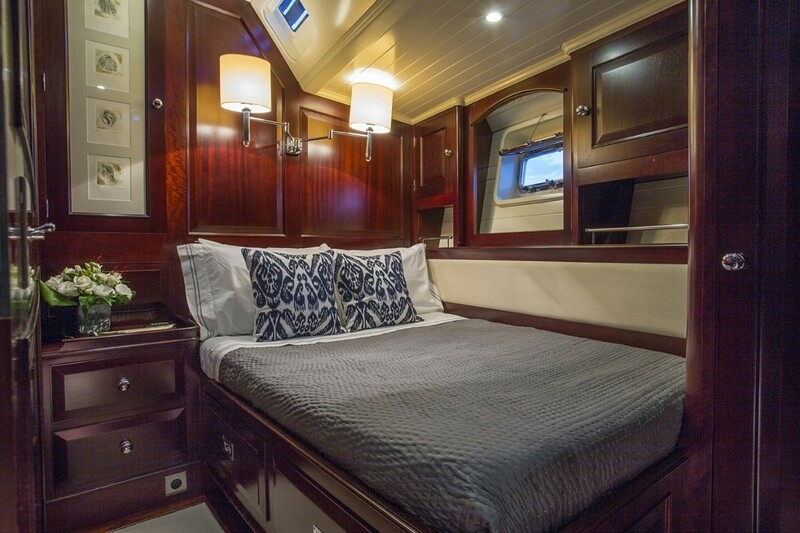 There is a gorgeous master suite, a VIP stateroom and a twin cabin. 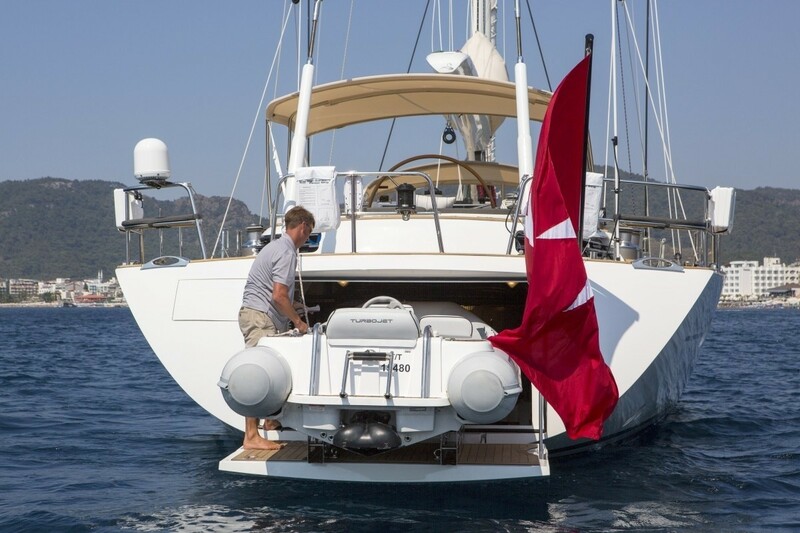 The vessel is taken care of by a professional crew of 4. 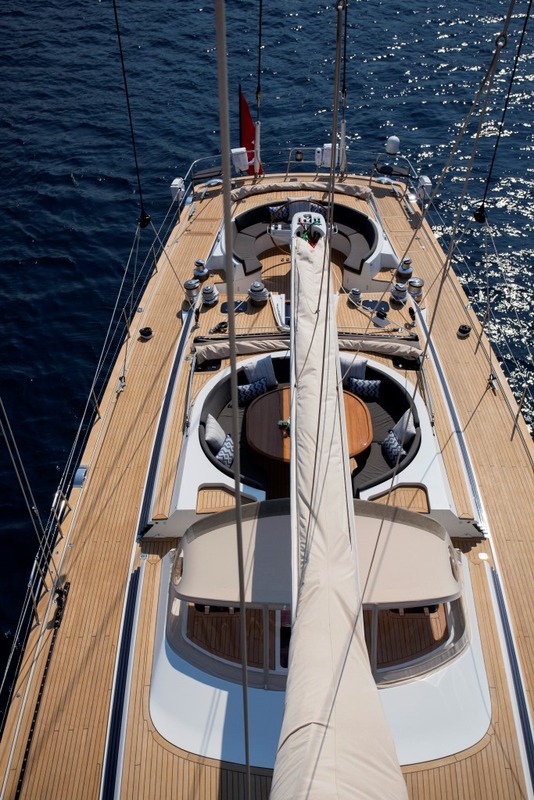 On her teak decks, there is plenty of area to relax and enjoy. The main salon leads out into a shaded guest cockpit and alfresco dining area. 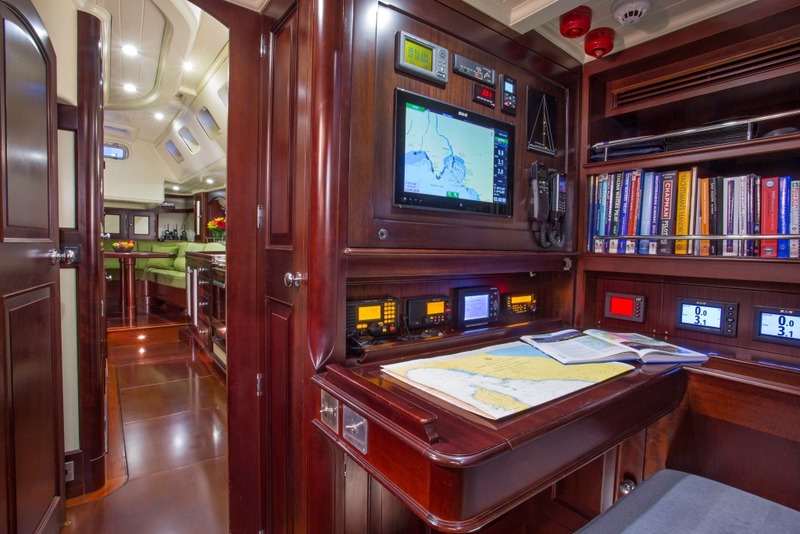 Further aft is the helm station. 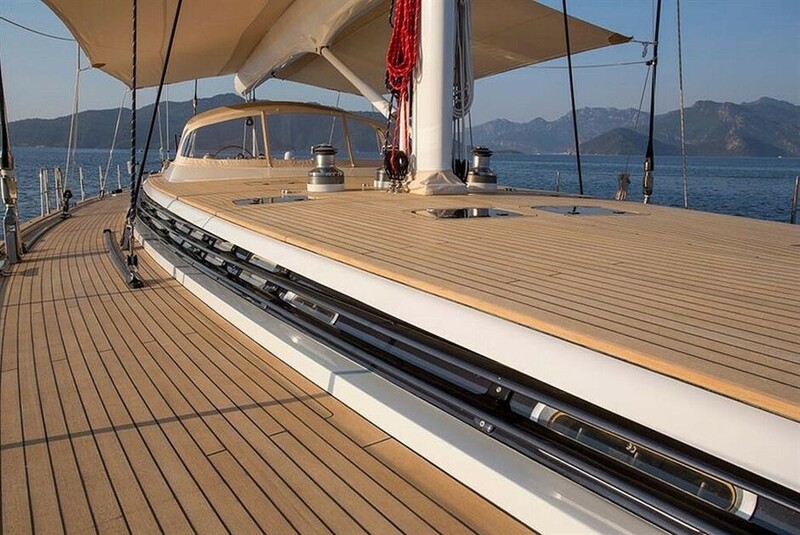 Flush decks lead from stern to bow with ease. 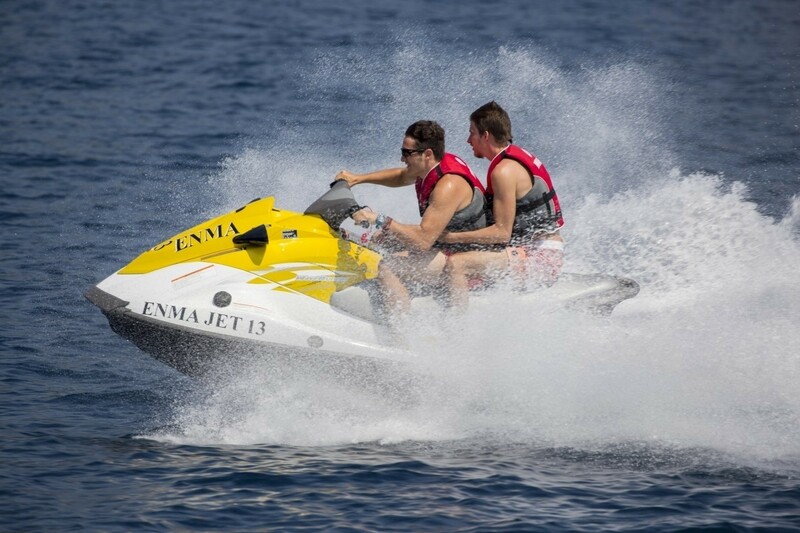 Water enthusiasts will be able to make the most of the water toys on offer, from a large fold out swim platform and toys garage. 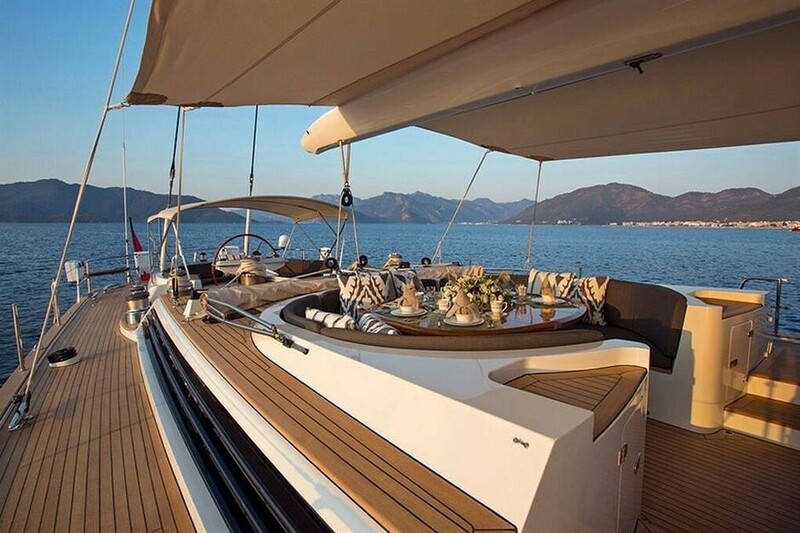 All-aluminium luxury yacht SAVARONA is run by a single Caterpillar C7 engine, giving her a comfortable top speed of 11 knots and a 10-knot cruising speed. 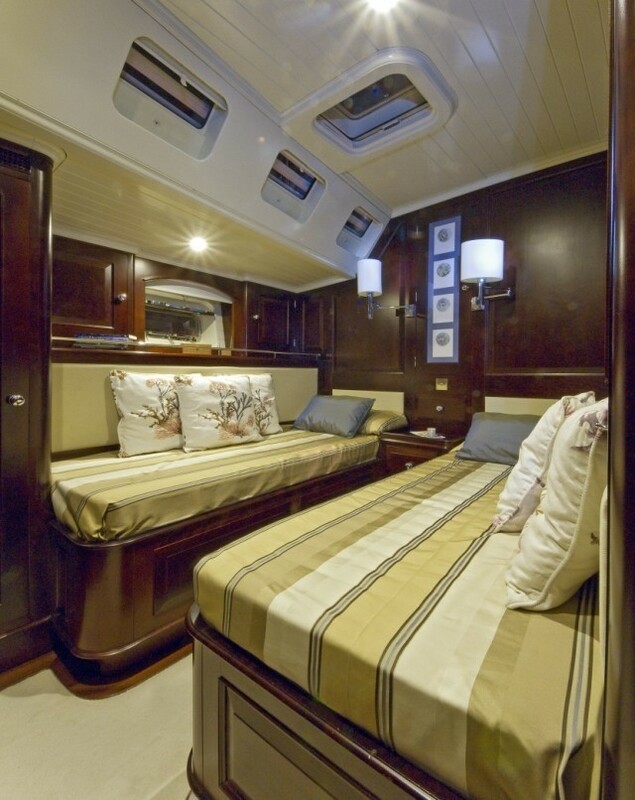 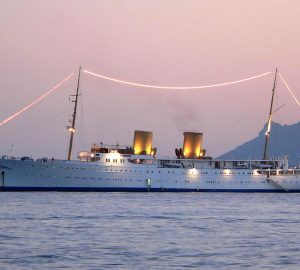 Accommodation layout consists of three well appointed staterooms for up to 6 guests. 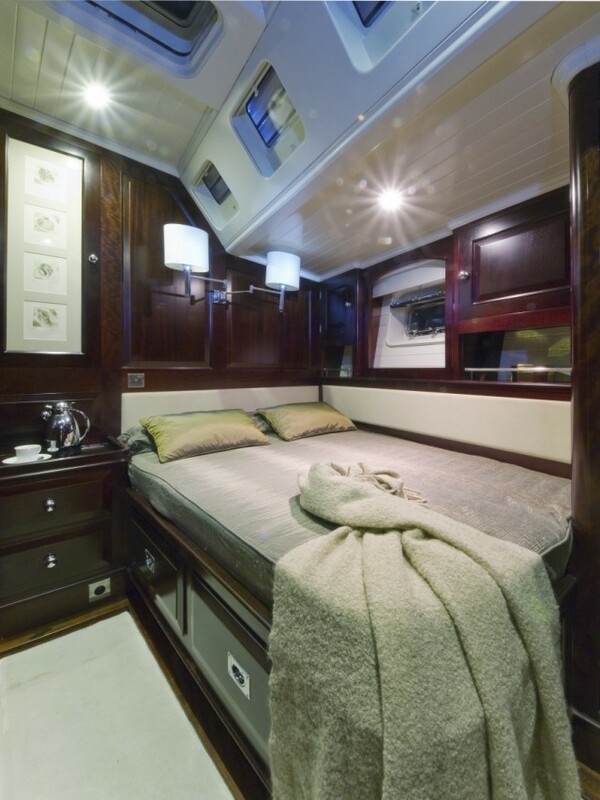 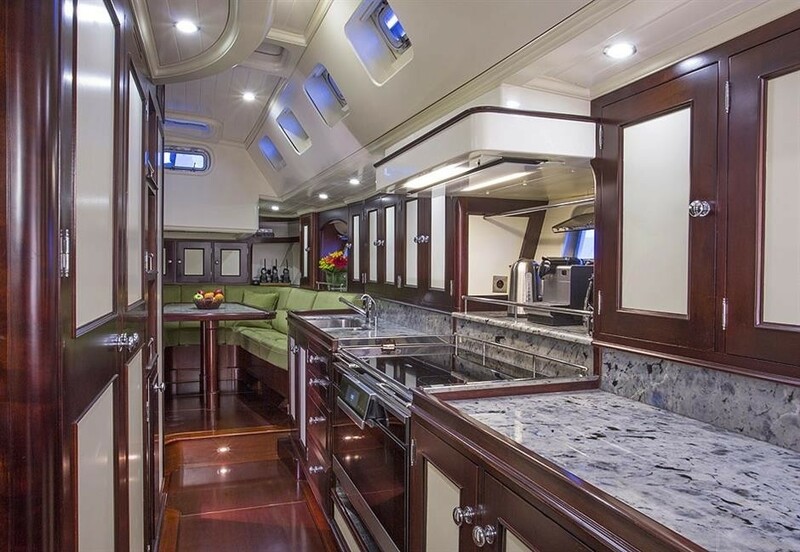 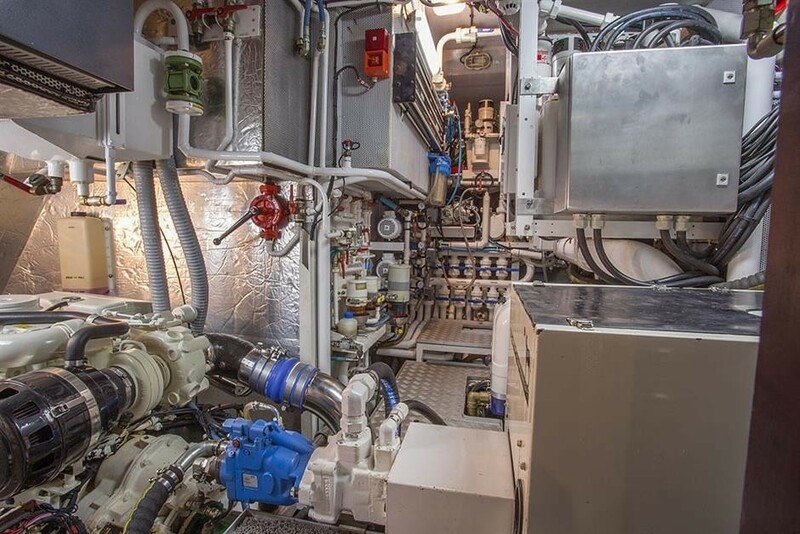 There is a lovely master suite, a VIP stateroom and a twin cabin, as well as space for a highly trained crew of 4. 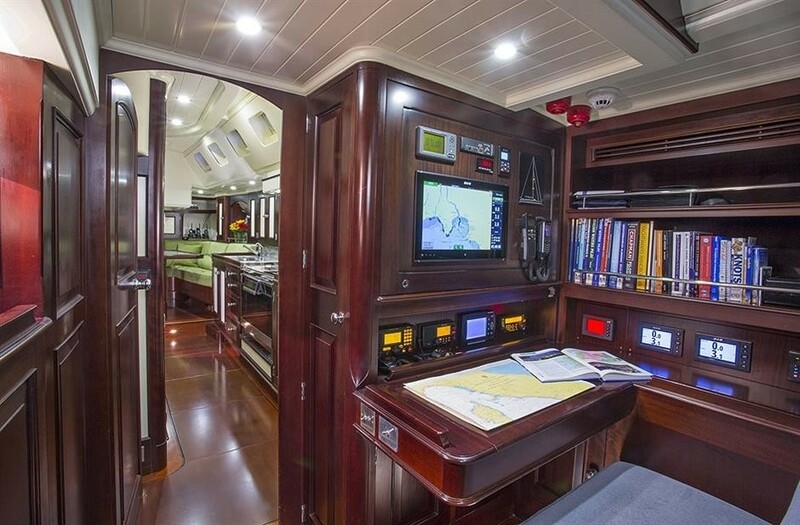 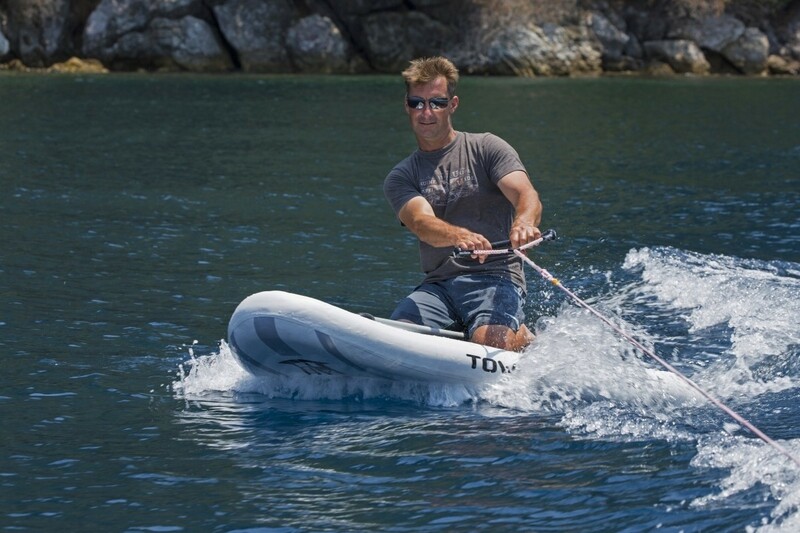 Tenders & Toys: Tender: Williams Jet 385 3.85 m 110hp, Sim Platform, Deck Shower, 6 sets of Snorkel Equipment, Fishing Gear, Kneeboards, Wakeboards, Towing Ring, Inflatable Paddle Board, Rendezous Diving. 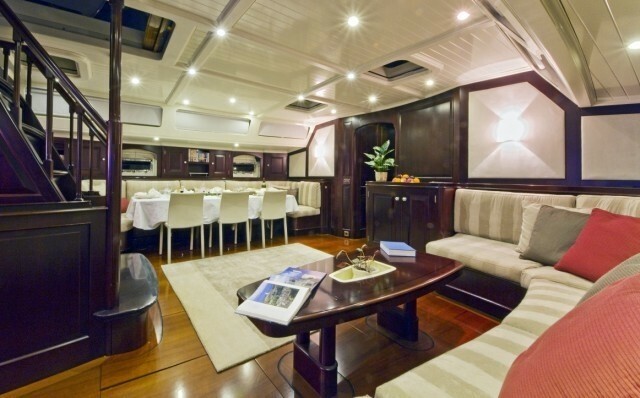 Audio Visual Equipment and Deck Facilities: IPad Docker, CD Players, DVD, Speakers in Cabins and Cockpit, Bose mini docking stations in all cabins. 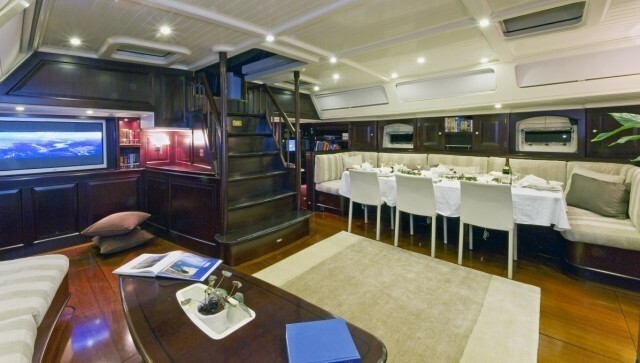 DVD library with over 500 movies/programms, Sky TV, Free internet available onboard (cell phone connectivity dependant).